In the NFL teams must contain a 53 man roster at the start of the regular season. 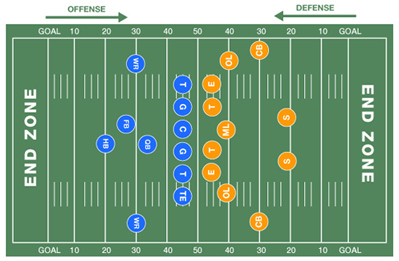 Each player in the NFL plays a particular position on offense or defense and has a certain job to do. There are only 11 men from each team allowed on the field, so there are 11 positions in offense and 11 positions in defense, and a few others for special teams. As I go on to describe each position be sure to refer back to the picture above and pictures below to get a better visual of where the position might be, but keep in mind that coaches design different plays that may place a certain player in a different location. Coaches can also run plays that have more of a certain position and less of another, so you may see more tight ends, more linebackers, or even more linemen to take the place of another position the coach will take out for a particular play. Center (C) – The center is in charge of starting the play by snapping the ball to the quarterback. The center is also responsible for blocking defensive players on the other team to keep them from getting to the offensive player with the ball. The center is the player that is in the middle of the Offensive Linemen on the line of scrimmage. Left Guard (LG/G) – The guard must block the defensive players from getting to the quarterback or any teammate that has the ball. If the guard needs to he can “pull”. This is when the guard moves from his position beside the center to be near the ball carrier and block for him. A guard will only “pull” on certain plays like “traps” – when the ball carrier will run inside, “sweeps” – when the call carrier runs outside, or “screens” – a passing play. The left guard is lined up on the left side of the center on the line of scrimmage. Right Guard (RG/G) – has the same responsibilities as the left guard but is lined up on the right side of the center. Left Tackle (LT/T) – The tackle must block for both running and passing plays. The tackles must work hard to block the defensive players from getting to the quarterback. If the quarterback is right-handed it is the Left Tackle’s job to protect the quarterback from being hit from behind, also known as the quarterback’s “blind side”. This tackle that has to protect the quarterback’s “blind side” is usually they more skilled offensive lineman. Tackles can also “pull” during a running play if there is a tight end on his side. Left tackles line up on the left side of the left guard. Right Tackle (RT/T) – A right tackle has the same responsibilities as a left tackle. But if the quarterback is left-handed it is the right tackle’s job to protect the “blind side”. A right tackle is lined up just on the right side of the right guard. Quarterback (QB) – The quarterback has the most important offensive job. He must receive the ball from the coaches and talk to them about what play to run. Then the quarterback informs his teammates that are on the field in a huddle. Then the quarterback breaks the huddle and the team takes their positions. The quarterback can stand in two different positions: 1.) “Under Center” – the quarterback is directly behind the center so that he can receive the ball in a hand-to-hand pass or 2.) “In the Shotgun” – the quarterback is lined up at a distance behind the center for a small pass. After the quarterback has the ball he has 3 options: run the ball himself, hand it off to another ball carrier, or throw a pass to a player down field. The quarterback must think and act quickly before the defensive players on the other team get to him. Wide Receiver (WR) – Those that run distances and get open to catch a pass from the quarterback. Wide receivers are considered specialists in pass-catching, but are occasionally asked to block sometimes too. Wide receivers stand on the far outside of the linemen near the sidelines to start the play. Tight End (TE) – A tight end is a mix between a wide receiver and a lineman because they can block or catch passes. Tight ends start on either side of and directly next to the tackles on the line of scrimmage. Tailback/halfback (TB/HB) – the player that is the primary ball carrier for rushing plays. They can also catch passes if necessary. Tailbacks line up behind the fullback. Fullback (FB) – the player that is the primary blocker for the ball carrier. This player is usually larger and stronger than the tailback. Fullbacks line up closer to the line of scrimmage than a tailback would so they can block. Fullbacks can also catch passes if needed. Wingback/Slotback (WB/SB) – a running back that starts behind the line of scrimmage on the outside of the tackle or tight end. These players are only found during certain offensive alignments. H-back – a modified tight end that lines up just behind the line of scrimmage. Defensive Left Tackle (LT/T) – can also be known as defensive guards. They are required to rush the passer, or in other words they must try to get to the quarterback and tackle him before he passes the ball. Defensive left tackles are lined up on the defensive line of scrimmage more to the left end side across from the offensive right guard. Defensive Right Tackle (RT/T) – has the same responsibilities as the defensive left tackle but is lined up to the right end of the line of scrimmage across from the offensive left guard. Defensive Nose Guard – A nose guard has the same responsibilities as a defensive tackle but is only used in rare formations. The nose guard lines up directly across from the center so that they are pretty much nose-to-nose. Defensive Left End (LE/E) – The defensive left end must try to stop the quarterback from passing the ball or stop any offensive runners that were given the ball. The faster of the two defensive ends is usually placed on the side of the quarterback’s blind side. If the quarterback is left-handed their blind side would be their right side so the faster defensive end would stand on the left side (opposite of the quarterback’s right side). The defensive left end starts to the left of the defensive left tackle. Defensive Right End (RE/E) – The defensive right end has the same responsibilities as the defensive left end, but starts on the right side of the defensive right tackle. Linebackers – stand behind the defensive linemen and obtain different responsibilities depending on where they are standing. Middle Linebacker (ML) – The middle linebacker calls out the plays and is required to react to any changes of the offense. The middle linebacker must also be able to stop any running backs that get past the defensive line, stop any pass plays through the middle, or rush the quarterback if given the opportunity. The middle linebacker stands in the middle of the defensive linemen and is like the quarterback of the defense. Outside Linebacker (OL) – They are mostly responsible for covering the offensive tackles. Some teams refer to their outside linebackers as other names like “right outside” and “left outside”, or “strongside”/”Sam” and “weakside”/”Will”. They may also be asked to rush the quarterback, or cover a running back to keep them from catching a pass. Outside linebackers stand on the outside of the defensive linemen. Cornerbacks (CB) – Cornerbacks must cover the wide receivers and keep them from catching the pass from the quarterback. The cornerbacks can swat the ball away or catch it themselves. During a rushing play the cornerbacks must tackle the ball carrier, direct him back to the middle to be tackled, or force him out-of-bounds. Cornerbacks mostly start behind the defensive line on the outside near the sidelines. Safety (S) – Safeties help cover offensive players to keep them from getting the ball. There are usually 2 safeties on the field, one being the strong safety and the other being the free safety. The strong safety is stronger and larger to help stop/tackle the offensive players during running plays. The free safety is smaller and faster to help cover the offensive players that run a distance to catch a long pass. Safeties are the defensive players that stand farthest back from the line of scrimmage. Nickelback and Dimeback (NB/DB) – an extra defensive back that will take the place of a linebacker. When a team feels they need extra help in pass coverage they will take out a linebacker and put in an extra defensive back, this formation is called a “nickel” because of the fifth defensive back. If there is six defensive backs the formation is called a “dime package”. Kicker (K) – comes in only to kick the ball for kickoffs and/or field goals. The kicker will always kick the ball off a tee or from a “holder”. In rare occasions a team’s kicker will also punt. Holder (H) – holds the ball in an upright position on the ground for the kicker to kick. The holder will normally be 7 to 8 yards back from the line of scrimmage. The holder is usually the team’s backup quarterback or punter. Long Snapper (LS) – a specialized center that snaps the ball at a much further distance to the holder or punter during kicking plays. Punter (P) – a player that catches the ball from the long snapper and drops it from their own hands to kick it a distance down the field. A punter is normally only used during a fourth down to push the opposing teams defense further down the field and away from the offensive team’s in-zone (touchdown area). Punt Returner and Kick Returner (PR/KR) – defensive players that are put in to catch the kicked ball of a punter or kicker. After they catch the ball they will run it back up the field as far as they can. These returners are usually the fastest players on the teams. Upback – used during punting plays and will be positioned 1 to 3 yards behind the line of scrimmage somewhere between the long snapper and the punter, but not directly in-between the two. The upback calls for the snap to begin the play. The upback is mostly used as a last line defensive blocker for the punter, but can also catch the snapped ball on fake punts and run it himself or throw it. Gunner – is used on the punting or kicking plays to quickly run down the field to tackle the punt returner or kick returner on the opposing team. The Gunner starts by lining up near the sidelines were he is less likely to be blocked. Now you know the positions in the NFL and their responsibilities. I hope this helps you understand the game more.